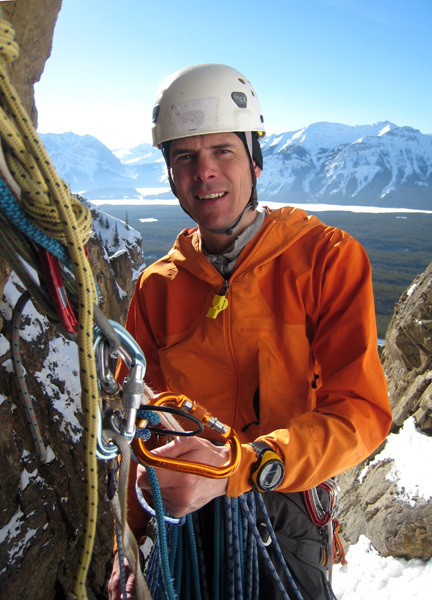 After our warm-up climbs at Haffner Creek and Evan-Thomas Creek, Carsten P. Cooper-Jensen was now ready for a real adventure. Together with Carlos Buhler we thus went to Opal Creek to climb two difficult routes: Whiteman Falls (95 m, IV, WI6) and Red Man Soars (55 m, IV, 5.10, WI4+). This was to be my first Canadian WI6 lead (had previously led WI6 in Norway and China), so I was pretty excited! The approach to Opal Creek is a beautiful adventure in itself. First we skied 5 km along a winter-closed road with stunning views of the Kananaskis mountains made even more beautiful by clouds hanging in the valley below us. Next we walked into the creek itself with beautiful narrow canyons. Carsten walked in front of me and suddenly yelled "I hope you have good nerves today!?". A littler later I could also see Whiteman Falls with at first looked pretty intimidating with its huge ice flakes and mushrooms. However, upon closer inspection it was possible to find a reasonable line through the maze of ice features and we thus geared up and began climbing. 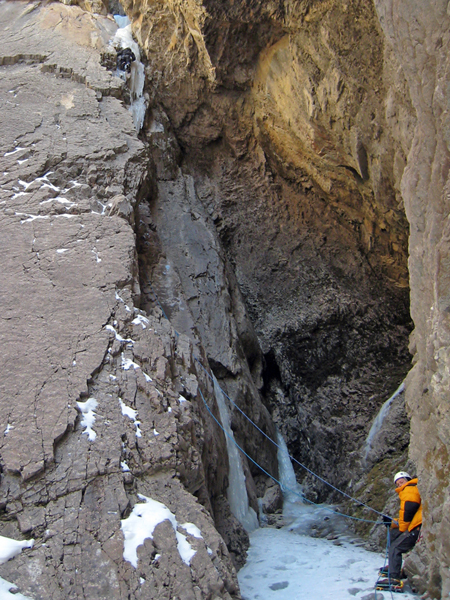 Carsten led the first WI4 pitch which was supposed to go halfway up the waterfall to a cave on the right. 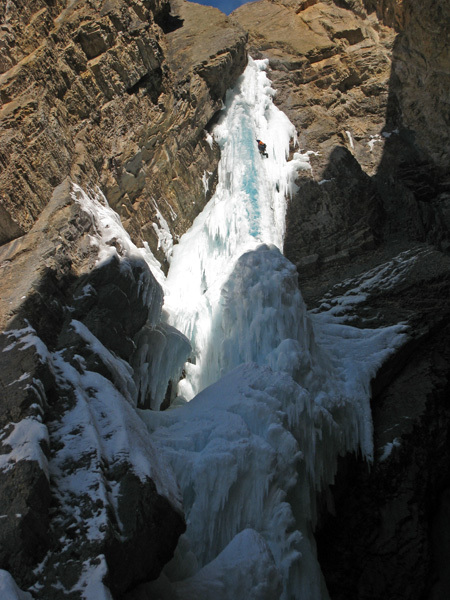 However, the traversing back and forth to negotiate the huge flakes and mushrooms at the bottom created so much rope drag that he eventually made a belay on top of one of the big mushrooms shelter from falling ice by another mushroom above him. 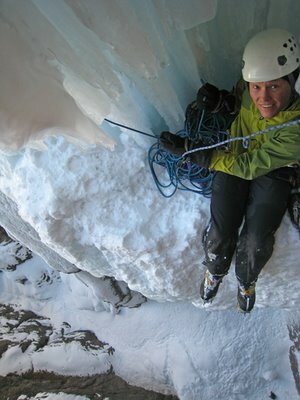 Next it was my turn to lead the crux WI6 pitch. It was actually nice to start from the mushroom rather than the cave as it gave me the opportunity to put in a couple of good screws before the going got tough. It was the wildest ice pitch I have ever led. The route is reputed for sporting running water below the ice you climb on - and today was no exception. Pretty wild to look at running water 10-15 behind crystal clear ice. Very beautiful but also a bit unnerving! I was thus very careful not to place ice screws into the running water as I didn't want to repeat the mistake on Murchinson Falls where I created a water shower for my followers! The route got increasingly difficult and climaxed with overhanging mushrooms at the top. Luckily it was possible to circumvent them by traversing back and forth, and once again I was very happy for my leash less tools which made these technical maneuvers easier (albeit not easy!). Next Carlos Buhler led the mixed route Red Man Soars (55 m, IV, 5.10, WI4+) on traditional gear. We were running out of time and Carsten was so generous as to offer me to clean the route. 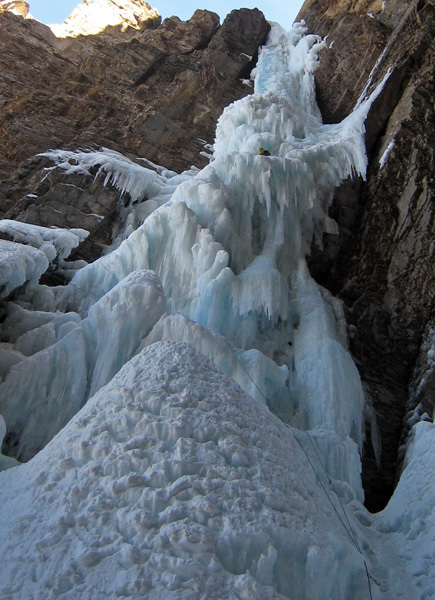 It was super entertaining climbing with good holds on rock and thin ice. The crux was to traverse from the overhanging crack system to the slab and the initial moves on the slab which offered absolutely no holds for the right crampon! Great lead by Carlos and happy that I got to second it. We then skied out with the mountain bathed in moonlight which was equally beautiful as the morning approach in sun light. 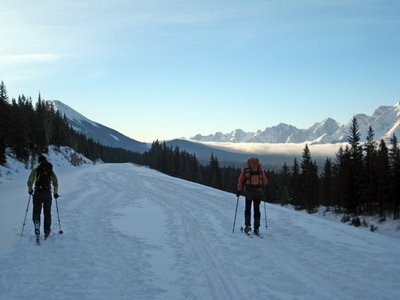 The ski approach to Opal Creek offered stunning views of the Kananaskis mountains with clouds hanging in the valley below us. Carsten at his belay on the mushroom in the middle of the picture. The "correct" belay is in the cave further up to the right. Carsten at his belay on the mushroom with his legs hanging in free air. Great exposure! 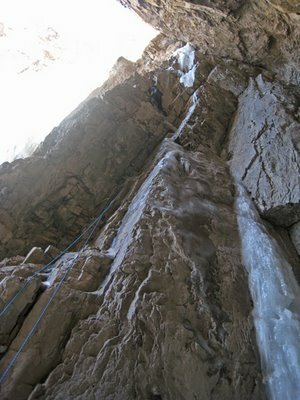 A Spaniard leading the crux WI6 pitch. The blue clear ice to his left is the pipe with running water below 10-15 cm ice. He is right under the crux consisting of overhanging mushrooms. A happy Hans at the belay after his first Canadian WI6 lead. Great view as well! Carlos leading the overhanging rock of Red Man Soars. Carlos on the slabs above the crux of Red Man Soars.